BLACK ICE AIR HOCKEY TABLE 7FT. SAM, famous for the very best commercial Air hockey tables, suppliers of air hockey tables for the UKs national finals and undoubtedly the largest Air Hockey producer in Europe have developed this machine to give the home user the genuine feel and speed of their ever popular commercial models. Created in sleek black laminated plywood cabinet, with matching black legs and cabinet corners. The bed/play surface is our commercially proven and fastest ever Methacrylite playfield which for style has been made in stunning high tech Black Ice. This super durable, scratch resistant high gloss black looks fantastic in any home and makes the puck stand out ensuring maximum enjoyment of the game. The Methacrylite bed has the added advantage that the scorer is mounted under the bed thus displaying the score clearly and removing the need for an overhead gantry or a surface mounted plinth. This keeps the tables sleek and smooth lines uninterrupted accentuating its superior styling and cool contemporary looks. The top rail of the table is powder coated for durability and features SAMs innovative puck retaining system which ensures the puck stays on the bed rather than flying around the room. With the solid construction, SAMs unique easy level system for the most accurate level possible, the super fast puck speed, the electronic scorer and sound system, recording goals and overall score plus music and sound effects; you will feel you are playing in your favourite bowling centre. SAMs EasyLevel Adjust height and level with a 13mmner, no lifting required. Marine Ply Cabinet for durability. Extruded metal top rail with puck retention system. Methacrylite playfield for speed and durability. Supplied with genuine SAM fast puck, a SAM quite/slow puck and two SAM bats. Easy access via keys to clear any foreign objects which fall into the goalmouth. Easy assembly on site, just bolt on legs, plug in and level withner. If you are located in an area that may attract additional cost, we will advise the most economical way to deliver the table. Areas likely to be affected are the Highlands, Offshore Islands, Northern Ireland and far West of Cornwall. Similarly, if tables are needed in upstairs or basement locations then additional manpower may be required and costs will vary. Finally, even if a room is big enough for a table, the access needs to be considered. Difficult access doesnt necessarily mean we cannot install, but we may have to advise a different table is used or flat pack and reassemble once taken to the room. 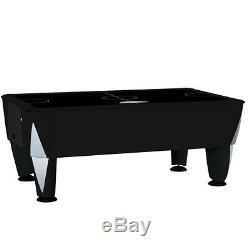 The item "BLACK ICE AIR HOCKEY TABLE 7FT" is in sale since Friday, June 24, 2016. This item is in the category "Toys & Games\Games\Air Hockey". The seller is "stemik1163" and is located in BURTON ON TRENT.